Last week at the eMetrics Marketing Optimization Summit in Washington D.C. there was a big buzz around the new Google Analytics features. But really, Google might win a prize for biggest industry shakedown (close to Adobe purchase of Omniture), but AT Internet would be a good contender for innovation in the field of web analytics. 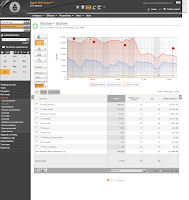 The France headquartered company has been pushing the web analytics envelope for a long time. Very strong in Europe, AT Internet was an early adopter of the freemium model with the Xiti solution launched in 1996! Beyond all those nice features, AT Internet approach is very different from other vendors. Their services can go as far as handling your analytics by providing dedicated analysts. This is one way of going beyond the tool and empowering their clients despite limited budgets and resources availability. AT Internet is doing a Montréal launch event for the NX version, along with the book launch of Nicolas Malo and Jacques Warren. I want to take this opportunity to acknowledge AT Internet great corporate citizenship: they are a corporate member of the Web Analytics Association and they frequently sponsor or present at local networking activities. Would be great if more vendors and agencies would get involved locally, as they do wherever they have offices. Full disclosure: AT Internet kindly offered a free account to test Digital WorkspaceNX, has sponsored Web Analytics Wednesdays in Montreal and offered occasional dinner, no money or other types of retributions were involved in exchange for this post.